I had the pleasure of viewing Alisha Trimble's Resort 2016 Blanche Du Mois Presentation last week. This Resort collection was inspired by a recent trip Alisha took to Saint Tropez. The foundation is a white palette with intimate separates that layer through to complete outerwear looks. Blanche DuMois is an original intimate apparel concept by Alisha, inspired by the female characters in Tennessee William’s literature. The fresh and fun layering concept works well with the feminine and glamorous ready to wear looks. Standouts for me were the breezy silk-cotton voile pintuck dress with a silk habotai lining as well as the silk broadcloth jacket belted with a grosgrain ribbon belt, paired with charmeuse nautical shorts and a crochet and fringe dress. The chic turbans were made by Stella Rose. A well appointed lounge at the Residences at the W New York Downtown with stunning views of Tribeca like this one provided a lovely backdrop for the presentation. To learn more about Alisha Trimble, you can visit the designer's website. 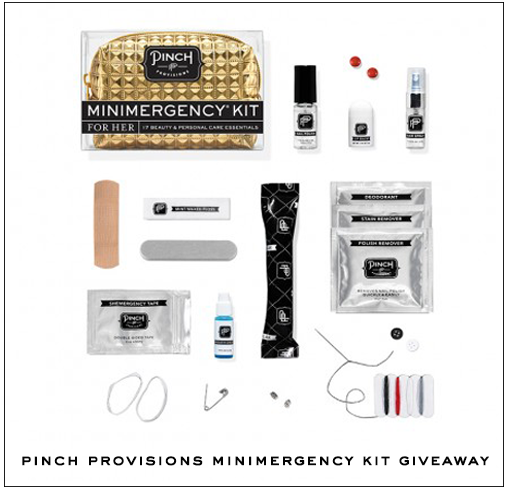 Have you entered my latest giveaway? 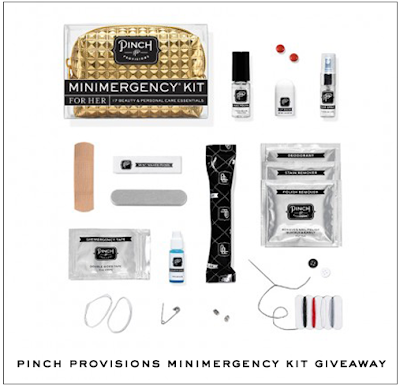 Win this cute Pinch Provisions Minimergency Kit packed with 17 handy emergency essentials! Cute shoots darling! Lovely collection!! This collection looks so St.Tropez for sure:) I love all the white outfits, and the turbans really go well with everything. This fashion is so chic love the different looks and style with the head piece great post. I love the two white dresses. They are so sassy:) Kisses, lovely. Wow that collection is so gorgeous! Lovely collection. I tend to always love resort style collections. Great inspiration from Saint Tropez. The resort style is really chic! I thought it would be the same old kaftan style but these turned out really unique and gorgeous. I'm usually not a fan of turbans but these turned out to be beautiful! Awesome collection :) Keep In touch dear.. Cool turbans, the perfect accessory for this lovely collection!!!! Oh wow, this resort collection is amazing...I love the unique designs! This collection is absolutely beautiful. I love the inspiration behind it. I've written papers on Tennessee Williams and I'm a great fan of his, I've read everything he has written and cried while I was reading one of his biographies. Blanche's name means white and I think her choice of white in the play matches well her stubborn ways...I like the fact she doesn't try to blend in...and something of that spirit is present in this collection as well. Another thing I really like are the turbans the model wear...they match the clothes nicely. All of these looks are way too gorgeous, thanks so much for sharing. I really like the top with the ruffled neckline. So cute. This was amazing Rowena! Oh how exciting to have attended this, and yes what great backdrop. The long white handkerchief dress is my favorite for sure. And awesome reporting. The fashion is very modern and contains unique pieces I'm loving. The location was perfect! I love these resort styles so trendy! loved seeing this resort collection! I like the first four outfits; light colours and delicate fabrics. What beautiful soft pieces! I love the draping and lightness of these pieces. I am all for white outfits anyway. Love this beautiful collection, Rowena. Hahaha about the ladybug. I am not afraid of ladybugs but of most of the other nasty bugs out there, you know. Happy Thursday, Rowena. The destination chosen for these collection photos is wonderfully stylish. The clothing is nice, although my eyes have immediately darted to the black tassle-strap heels - they're perfect! The collection looks so stunning and stylish <3 Great photos as well. What a stylish way to add some glamour to an outfit! I would definitely go for a turban instead of a hat! Perfect - not only for South France! ;-)) I love your photos, my dear! This collection looks lovely. Very classy. The head gear is pretty cute. I like that addition. How exciting! While I'm not fond of the head wraps, I do like some of the other designs. I think the all white dress is my favorite!